Welcome to Hope Community Cancer Center! HOPE Community Cancer Center a division of Regional Cancer Care associates located in southern New Jersey provides expert comprehensive care in the fields of hematology and oncology. Dr. Childs, Dr. Dave, Dr. Ahmad and Dr. Rahman are pleased to announce a second location of HOPE Community Cancer Center, in an effort to provide more convenient service to our patients. We will continue to serve our patients in our Marmora, office at 210. South Shore Road, Ste., 106 Marmora, NJ (609) 390-7888. The patient entrance is now suite 106. Additionally, we have opened an office in Cape May Court House at 211 North Main Street, Ste. 100 (609) 536-8414. Dr. Dave, Dr. Ahmad, Dr. Rahman and I wish to assure you that we will provide you with personalized and excellent care. We are pleased that you have chosen to seek your care with us. We are here for you and will work with you to meet your health care needs. 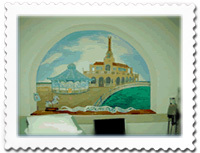 Our goal is to provide you with expert comprehensive care as well as “TLC” – tender loving care. Our wonderful staff is here to help you. You and your family members are encouraged to call us if they have any questions, problems or concerns. Dr. Dave, Dr. Ahmad, Dr. Rahman and I are available by telephone 24 hours a day. We can be reached simply by calling our office number 609-390-7888 and after hours it will take you directly to our answering service and they will be glad to assist you. Hope Community Cancer Center came into being in 1995. I initially started out in private practice in 1995, and practiced alone for 2 years. I was then joined by my associate Dr. Hemang Dave, MD. It was 2 years later that we decided to broaden our practice and try to include access to more than just medical oncology and hematology. Now our practice has grown to include Dr. Kaleem Ahmad, MD and Dr. Fahd Rahman. We wanted our patients to have access to nutritional counseling, social services and psychological counseling. We wanted our patients to feel as if they were treated as a whole person, not just as a diagnosis. We also wanted them to have hopefulness and even some joy when they came to our office. We had artist Jeanne Elodie paint murals in the waiting rooms and the examining rooms to help brighten them, knowing that many patients are frightened in an oncologist’s office. We then chose the name "Hope Community Cancer Center". The HOPE logo includes a tree, which I wanted to represent the "Tree of Life". Artist Susan Weis took this idea and placed a heart in the center of the tree, to represent our strong desire to treat our patients not only with the best clinical medicine but also with tender loving care, with "heart". We hope that you will find our community cancer center has just the right balance for you and your loved ones.